The countdown is on to a (hopefully) relaxing three day weekend in the sun! For those of you that are last minute packers like us, we’ve put together 10 weekend essentials that you’ll want to make sure you toss in your bag before you head off to your getaway destination. 1. Maxi Dress: A dress that transitions from day to night is a must. Packing multi-purpose dresses will save you some room in your bag! 2. Portable Speaker: What makes laying by the pool or hanging by the beach more fun? Tunes of course. 3. Sandals: Toss in a couple of pairs to mix up with your outfits. 4. Swimsuit: Don’t forget your suit, of course! 5. Sun Hat: A floppy hat is not only a fashion statement, but a skin saver! Protect your face from an unwanted sunburn. 6. Sunglasses: Don’t forget your sunnies! 7 & 8. Beach Towel & Bag: If you’re headed to the beach or on a boat ride, don’t forget a beach towel since hotels don’t always offer them. 9. Reusable Water Bottle: Going on a hike? Don’t forget to bring a reusable water bottle. Toss in an extra just in case one of your friends forgets their own. 10. Sunscreen: Last but perhaps the most important… sunscreen! Protect your skin whether you’re in the sun or shade this weekend. If you have little ones that are battling you every time you try to put sunscreen on, try spray sunscreens or tubes with colorful packaging to make it a bit more fun for them. 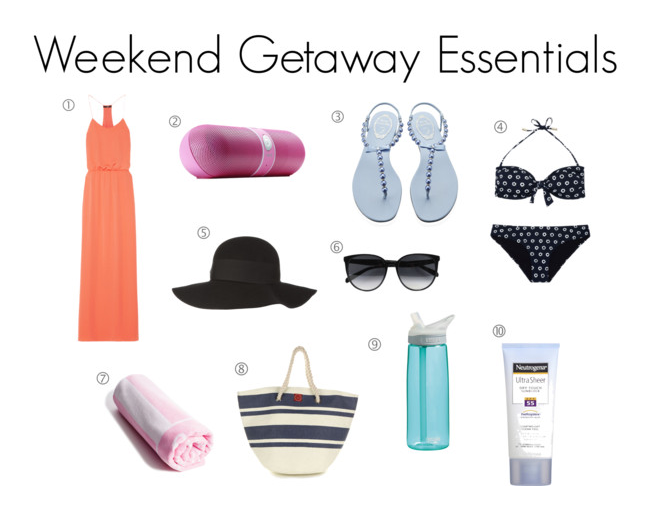 Are there any weekend getaway essentials that we’re missing? Let us know in the comments.